What are some of the best Christmas movies ever made? Obviously, there is A Christmas Carol, It’s a Wonderful Life, A Christmas Story, Miracle on 34th Street, etc. etc., but what about the other…newer films? Honestly, it doesn’t take a lot to be a bad Christmas movie in a lot of people’s eyes. I don’t necessarily say bad…I say different. Not every movie can meet the standards of the best Christmas films, because let’s face it, there’s not much territory left for greatness. I will say that a really great film comes along every 5-10 years that at least makes my annual Christmas film list, and one of those is without a doubt Jingle All the Way, starring Arnold Schwarzenegger. 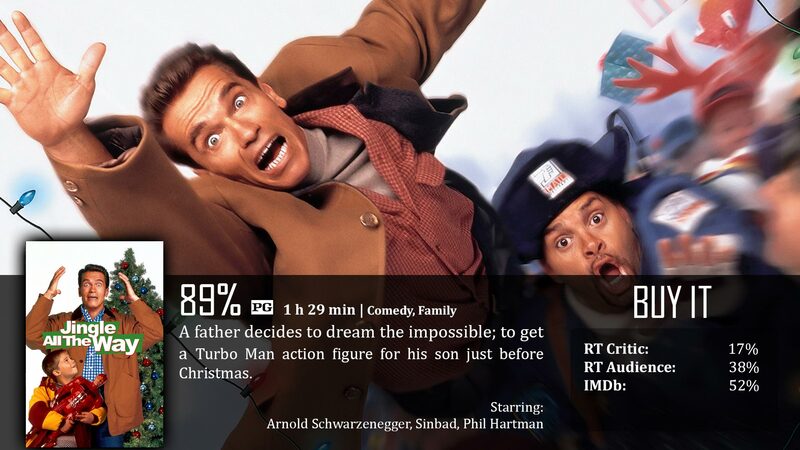 Arnold Schwarzenegger plays the workaholic father that never has time for his family or son in this family-oriented Christmas flick. When he misses his son’s karate class, he promises to make it up to his son by buying him what he’s wanted the most, a Turbo Man action figure. Problem is, this time of the year, you won’t be able to find it anywhere because it’s the hottest toy of the year. So battling other angry shoppers, he grasps at straws to find a solution, any kind of solution, to get that toy. As I go through the month watching these Christmas films, I’m starting to notice a trend in what a better Christmas movie entails, and that completely differs depending on who you are. If you like movies that aren’t exactly about Christmas, but take place during the season, then you have a completely separate selection than those who like a Christmas film to be just that – a Christmas film. So some of you might call Die Hard a Christmas film, I don’t. I say it takes place during the holiday, but that’s about it. I do call Jingle All the Way a very solid Christmas tale, and I love it. I’ve always had a soft spot in my heart for Arnie films – action, comedy, family-friendly, you name it. Each one have these different elements that really help the film out, because Arnie has such a loveable personality all around, and yes, he is a very funny guy. He fits so well tearing people apart, but also as well as a family man. Jingle All the Way has a lot of Christmas spirit and is just goofy enough to have a consistent light tone throughout. There are unbelievable things that happen now and then, like running into a bunch of Santa costume-wearing crooks selling stolen and broken toys, and honestly a lot of what happens in the end, but it is hilarious enough to shrug off as “Christmas magic”. In the end, this film is one I love to watch year in and year out. Without Schwarzenegger, the film would be nothing, as it apparently depended on him saying key things that were clearly molded and stereotyped solely for him. That is something I’d normally complain about, but I’m glad they did it – it has a very slight feeling of a self-aware parody, and I like that. Arnold Schwarzenegger is a great actor who always has a different level of entertainment to bring to the table in practically everything that he is in. Jingle All the Way is a very funny instant classic Christmas tale that people will be watching until the end of time. Not much, is a bit too over-the-top goofy in parts, and it has some plot holes (the gift certificate introduced at the radio station guaranteeing a Turbo Man doll completely vanishes in the next scene). For some, this may be bad. Nice man. I literally just reviewed this last Thursday. What a goofy classic. I couldn’t believe when I saw this movie on a “Worst Christmas Movie Ever” – list last week, because I agree with you! It might the over the top and unrealistic, but what Christmas movie isn’t?? Fun characters and great actors that make this gem work! I will watch it right now, LoL! Great Review!